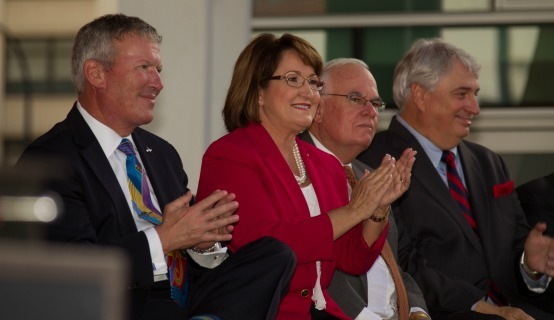 Orange County Mayor Teresa Jacobs provided the opening remarks at the Dr. Phillips Center for the Performing Arts’ highly anticipated grand opening and ribbon cutting ceremony in the heart of downtown Orlando. The historic grand opening marks yet another milestone for Central Florida in the continued transformation of Orange County into a world-class destination for the arts, recreation and culture. The new state-of-the-art facility will be a Mecca for creativity and discovery. Where artists, audiences and students will gather to experience, learn and explore the performing arts, fulfilling the vision of the Dr. Phillips Center, Arts for Every Life. The two-block community space features the 2,700-seat Walt Disney Theater, the 300-seat Alexis & Jim Pugh Theater, Seneff Arts Plaza, School of Arts, the DeVos Family Room, and other spaces to host theater, dance, popular music and entertainment performances. Future expansion plans include a 1,700-seat acoustic theater, rehearsal room and commercial development spaces. In 2013, the Orange County Board of County Commissioners approved a $94.5 million venues package that allows the use of the Tourist Development Tax to fund various community performing arts, sports and recreation and tourism venues. The Dr. Phillips Center is a public-private collaboration with the City of Orlando, Orange County, the State of Florida and generous donors. To celebrate its grand opening, the Dr. Phillips Center is hosting a Community Open House on November 8 and November 9 starting at noon, with a preview at 11 a.m. for Dr. Phillips Center members. On November 15 at 8:30 p.m., there will also be a one-time performance of Broadway & Beyond at the grand premier of the Walt Disney Theater. Directed by acclaimed director and producer Richard Jay-Alexander with musical direction by Broadway’s Mary-Mitchel Campbell, Broadway & Beyond is an exception show that featured luminaries from Broadway, and beyond, including international music and dance performers. For more information on the upcoming shows and events taking place, please visit the Dr. Phillips Center website. A collection of photos from the ribbon cutting ceremony can be found on Flickr for use by the media.